Photolithographic and astronomic filters are available in this section. 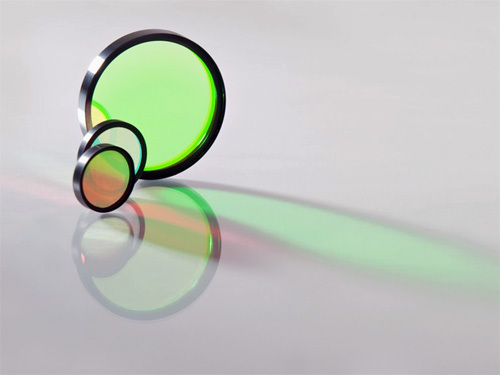 The different optical filters available are as versatile as the applications are varied. Bandpass filters customized to meet the requirements set by industrial image processing (machine vision). In order to acquire exact images exhibiting minimum background noise, cameras are equipped with bandpass filters. These filters are designed to transmit only the spectral range of the illumination source. To obtain perfect imaging results, the machine vision filters have to satisfy different quality requirements. This includes an optimal signal-to-noise ratio. Back reflections can be prevented as much as possible by using an AR-coated substrate. We offer a special range of filters suitable for all wavelengths of our line laser modules. The filters excel through their insensitive surface while barely aging – a property of the hard coating. The transmission properties do not change over the years. The filters are available unmounted and mounted with a camera filter thread.